Michael Janzen at Tiny House Design has posted an extremely useful series on how to draw a tiny house in SketchUp. In part one, he posted his base trailer file in a comment. The trailer he used is a 20 foot trailer. The one I used is a 16 foot trailer so I redrew it. 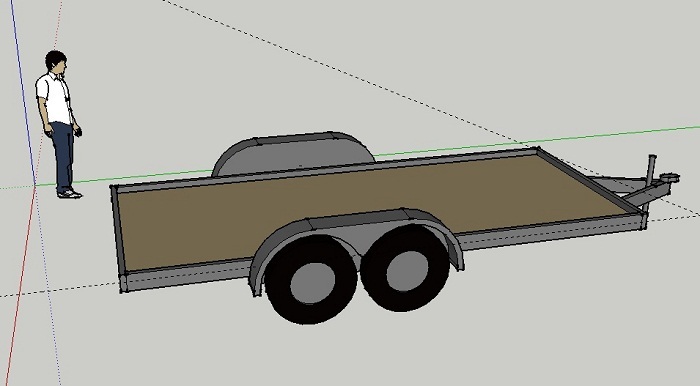 I’m posting the 16 foot trailer SketchUp file here for anyone that would like it. Just click the image below. I’ll also post it in the comments on Michael’s site. There’s also a cut list plugin linked to in the comments of that post too. I’ll be doing a complete SketchUp for the tiny house I’m finishing up over the next few weeks. This entry was posted in Planning and tagged 16 foot trailer, SketchUp drawings. Bookmark the permalink.